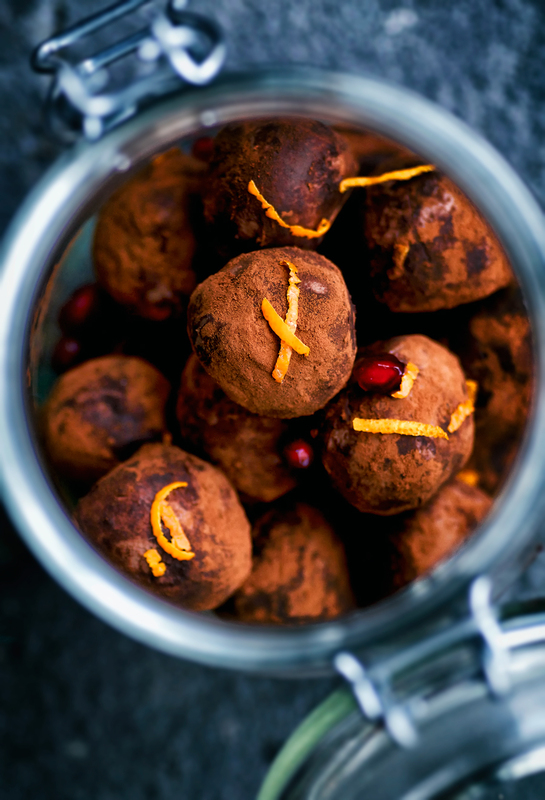 Vegan chocolate truffles with bright winter flavours of ginger, orange and pomegranate – make these as a food gift for Christmas or as a treat for yourself. 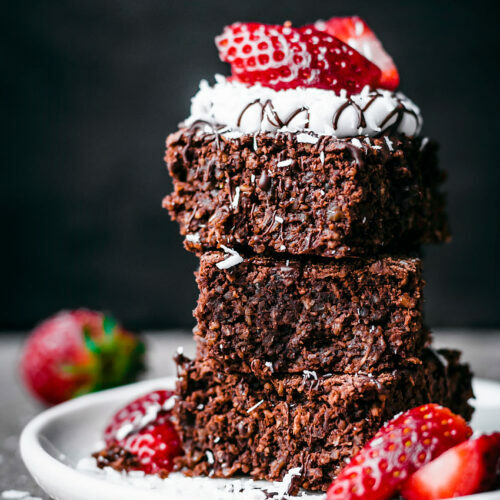 These are so easy and you can’t beat the taste, even though they’re made with coconut cream instead of dairy. Making truffles at Christmas time is a bit of a family tradition. My mom got my sister and I started when we were little and it was always so exciting to make them and have a good reason to get covered in chocolate. A few years ago I switched to making them with coconut cream, and no one’s ever complained. I think, if anything, I’ve had more compliments on my vegan chocolate truffles than on the standard heavy cream ones I used to make. It’s not that they’re healthier, necessarily, as truffles are inevitably high in fat, but this is certainly a very low-sugar recipe and a little healthy fat is good for you in small doses! Small as in truffle-sized. Truffles are another thing that’s really easy to make dairy-free and vegan without any difference in taste and texture. The method is so simple, and people are always happy to get a little jar or box of truffles. If you have kids it’s really fun for them to help roll the chocolates, and since they’re meant to be a little imperfect anyway, it’s a great job for little hands. I ate a lot of the truffle mixture as a kid though so keep an eye on that, hah. As if I don’t still lick my hands after making them. 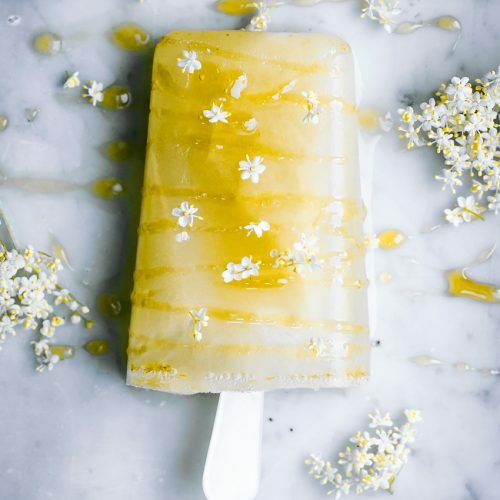 This is a bit of a winter/holiday inspired flavour with fresh ginger, orange zest, and pomegranate, and it’s a lovely combination. 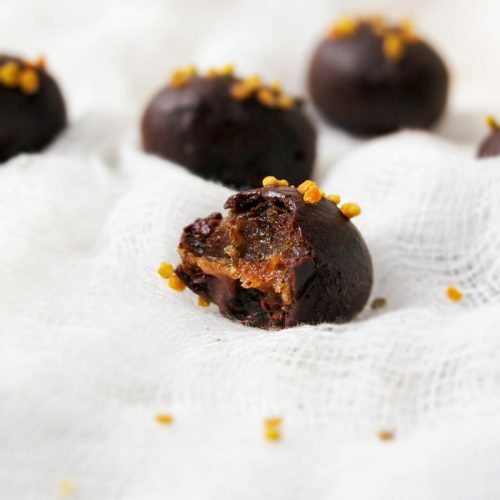 My original plan was to do simple chocolate orange vegan truffles, but a little spiciness from the ginger and the pop of the pomegranate is great. They’re a bit more decadent than my usual ‘truffles‘ but perfect for a Christmas treat. Just pack them up in a pretty jar and you’re done. I usually make a batch or two ahead of time and freeze them – if you do that, just thaw them in the fridge and re-roll in cocoa before packaging as gifts. The truffles tend to absorb a bit of the cocoa the longer they sit so doing that will just ensure that they’re still pretty when they’re gifted. Just a note that these are truffles that are meant to be rolled in cocoa, not dipped in chocolate, so they may seem a little harder to roll than you might be used to. They can’t be too soft or else they simply lose shape altogether. I usually squeeze and roll into a roughly spherical shape, freeze for 10 minutes, then roll them between my hands again to make them a bit cleaner looking before coating in the cocoa. They’re still smooth and creamy when you eat them. I have one more chocolate recipe for you tomorrow and then it’s Christmas! Happy last minute prepping! 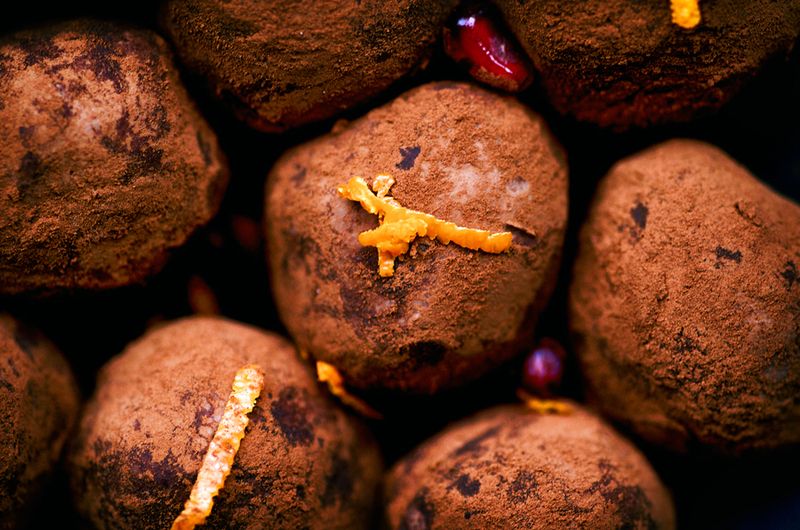 Vegan chocolate truffles with bright winter flavours of ginger, orange and pomegranate. These are so easy and you can't beat the taste, even though they're made with coconut cream instead of dairy. Place the chocolate into a heat safe bowl. Pour the coconut cream into a small saucepan and heat over medium, until simmering. Pour the heated cream onto the chocolate and let it sit, without stirring, for 30 seconds. Add the orange zest, ginger, vanilla, and salt to the bowl. Whisk until the chocolate and cream are smooth and fully incorporated. Cover and refrigerate overnight to set, or a minimum of four hours. Once the truffle mixture has set, use a spoon to scoop out about a teaspoon for each truffle. 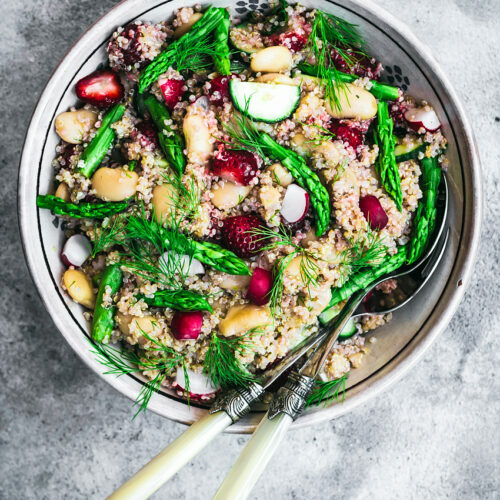 Place a couple of pomegranate arils in the centre and squeeze with your hands to close the truffle, then roll into an approximate sphere shape. Continue until all of the mixture has been used, placing onto a board or sheet lined with parchment paper. Freeze the truffles for 10 minutes, then remove and roll gently between your hands to clean up the edges and make them more ball-like. Roll each in cocoa powder until coated, then place into a sealed container or jar and refrigerate until needed. To serve, bring them out of the fridge about 15 minutes beforehand to soften slightly. • You can also dip the truffles into dark chocolate instead of rolling them in cocoa. Just melt chocolate over a double boiler with a half teaspoon of coconut oil, then use a fork to dip the truffles. Do this if they need to be able to sit out of the fridge for a while. • To make extra cute baby truffles, do about a half teaspoon per truffle and one pomegranate aril in each one.